2017 will be an exciting year: at the end of last year I managed to complete the manuscript for ‘Social Leadership – my first hundred days’, a practical illustrated guide based around 100 activities for the nascent Social Leader, and today I’m moving straight into several weeks of writing to complete the manuscript of a major book to follow that. A guide to organisational change in the Social Age. Over the last two years I’ve shared around 70 different posts here on the blog covering the subject of the Dynamic Change Framework, and last year I introduced the notion of the Socially Dynamic organisation, an organisation that is adapted to the realities of the Social Age, agile in its DNA. This month, my intention is to complete the manuscript for this book. In the best traditions of #WorkingOutLoud, I will share my progress as I do so, not necessarily because the work is sufficiently complete to do it justice, but more that by making this commitment, and with the support of this community, I hope to find the momentum to get it done! I find this part of writing, to be totally honest, the most daunting. I sat down today with the full manuscript as it stands: 44,000 words across 35 sections, 80 illustrations, and a great deal of red highlighting and comments. Working with a text this large is always challenging: I find that I need dedicated time to get my head right into it, and there is a real risk that I become too nervous to change anything lest I lose the thread. It’s that thread which is most important: I read a book over Christmas which I greatly enjoyed, but which, sadly, was poorly written and badly edited. It read like a series of separate essays, with much repetition. That is my greatest fear: that by jumping back into the text now I somehow fragment it. Today I have focused almost entirely on the high level structure, tuning myself back into it: I do this by sitting in a room by myself and reading out loud! Literally reading out the names of each section in turn and giving myself a narrative of what is in that section and how it relates to the sections before and after. Whilst this doesn’t give me any productive output in terms of new words on the page, I think it helps me ensure that the flow is there. As a result of this, I have made some quite dramatic changes to the structure of the book: just moving around existing sections, and renaming some of them. I’ve also colour-coded each section: two thirds now sits at Amber, which means it has some good content and just needs the rough edges rounded off, and one third of red, which means it’s either missing or simply no good yet. If I can keep my focus, by the end of next week, I hope to have the whole thing at Amber. If I get to that stage, where the structure of the book is right, and all sections are populated, then all that will remain is one more pass through to ensure it all links together correctly, at which point I can get back into the illustrations. As is my custom when writing, I will share some sections as I go. The following section is the introduction: I shared an earlier version of this last year, but this has some edits and is the only piece of new writing that I’ve done today. This is a book about change. It’s about the massive challenge that many organisations face as they strive to become fit for the Social Age, as they navigate the collapse of the old world that they inhabited, with its certainties and conventions, and head into a brave new world where everything has changed. The Social Age forms the backdrop to this book: the fracturing of the social contract that connects individuals and organisations, the rise of the portfolio career, the democratisation of communication and creativity, the emergence of all pervasive social collaborative technology, the erosion of old forms of formal power, usurped by newer socially moderated ones, and all that is barely to scratch the surface. This is not a book about small scale, easy change. It’s about broad, holistic and dynamic change. It’s a picture about the organisation we need, not the one we have inherited. It’s a book about individuals, and about the organisations that they work within. It’s a book about how change affects those people and how those people affect change. It’s a book about how we can both understand and influence the process, with the aim of helping organisations reflect and restructure, becoming truly agile and dynamic in both mindset and action, truly fit for the Social Age. We will be taking a long journey: firstly, to understand the nature of change itself and to familiarise ourselves with the true nature of the Social Age, secondly to work our way through the dynamic change curve and understand the difference between resistant, constrained, and dynamic organisations, and thirdly to explore the Dynamic Change Framework, which gives us a route map for change. In this book I use the term ‘Socially Dynamic organisation’. I set this up in contrast to the older, hierarchical, controlling and constrained organisation, a remnant of Victorian management structure and outdated mechanisms of control. The old systems were appropriate for their time, but that time has passed. Much of the challenge that we face sits in the dynamic tension between the old and the new: resistance being deeply embedded in old structures of power, in opposition to new, socially moderated forms of power. Old power is deeply embedded within many organisations: it’s embedded in many societal structures too. And it’s not good enough. We cannot compete, we cannot adapt, if the best we have is formal hierarchy and a belief in outdated notions of career and power. This is the heart of the challenge: to change the organisation is not simply to change the structure, but rather it is to change the nature of power itself. The Social Age is a broad swathe of change: our adaptation needs to be equally broad. Socially Dynamic organisations are not simply good at reacting to pressure within an existing structure: they are fundamentally adapted, both at an infrastructural and sociological level. They are re-engineered to be fit for purpose. That re-engineering is tough: it’s broad and holistic, like trying to win a rally in a formula one car, you just can’t do it unless you reimagine from the ground up. Sure: they’re both cars, but one is entirely unfit for the purpose required. As our organisations move into the future, this is the question that they will need to ask: are we fit, are we adapted? Why? Because the Social Age is a time of constant change: to thrive, organisations must adapt. But that adaptation means change in itself, change which is hard to visualise and harder still to embark on, to steer and to achieve. The result? At best, lethargy, churn and lost opportunity. At worst, extinction. The world is in flux and those organisations that fail to adapt will simply fail. We see waves of change sweeping through financial services, technology, medical and education sectors, through the creative industries, publishing and even the military and government. Change is not the exception: it’s the norm, and when the environment we inhabit changes, we need to adapt, fast. There are many pieces in this jigsaw: this book addresses a central one. How organisations change, how they can change better by co-creating that change. That is the central tenet: to change by tapping into the wisdom and lived experience of the community you already have. That is what we are going to explore in this book. Change is complex: both in it’s conception and execution. It involves a journey from intent to transformation and requires both micro and macro adaptation. Intention is easy to come by, whilst transformation is remarkably hard to achieve. With the Dynamic Change Framework, we seek to use our understanding of the new world, and our understanding of social dynamics, to complete this journey. Organisations tend to fail in predictable ways, we will explore these, and take practical steps to avoid them. Organisations progress at different speeds, with different levels of success: many become constrained along the way, losing energy and vision. We will look in detail at the Constrained organisation, and understand how we can overcome constraint ourselves. This is no theoretical journey: everything in this work is practical. Indeed, I’d argue that it’s more practical than many things done within organisations today, because this work is all about people like you and me. People who, if treated fairly, if given the chance, may turn out the be the most valuable gift an organisation can receive: engaged and effective, dynamic and rewarded. In this picture, you can see a change curve that bifurcates: on one leg, we achieve momentum and transformation. On the other, we end up with churn and lethargy. Between these spaces, most organisations fall and fail. We will explore every aspect of this change curve: what it means to be ‘Resistant’ to change, what it means to be ‘Constrained’, what it means to be ‘Dynamic’, and the stages we go through as we transition between those stages. In that sense, this book is intended both as diagnostic and toolkit: allowing an organisation to reflect on where it sits on the Change Curve and to take actions to move up it. What’s the opposite of change? I’ve settled on lethargy and churn: that warm and comfortable illusion where we think things are fine, that we are doing the right things, whilst the world collapses around us. Lethargy is where we fail to gain understanding, buy in or momentum. Churn is where we rush to activity, but fail to achieve transformation. Lost opportunity is where we fail to innovate, to adapt, to be creative in our approaches to our evolved ecosystem and to grasp the opportunity that it presents to us. 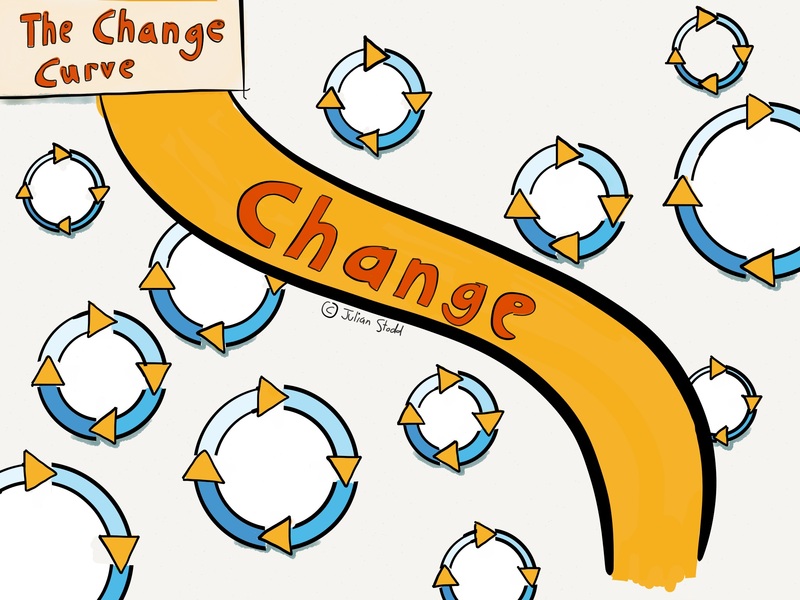 Many organisations that think they are changing are, in fact, in a state of churn. Busy, but ultimately just splashing. Some are still in denial, or mistake holistic change as simply being about millennials or technology. In fact, it’s neither and both: technology is simply one of the most visible manifestations of constant change, and millennials are simply the first to adapt. They are the canaries in the mine, not the gas that will kill you. They are certainly not the problem. The problem is in those organisations unwilling to listen or unable to adapt. Those are the mindsets that will finish us off, that will consign us to darkness. The origins of this book are through a series of articles #WorkingOutLoud on the blog. ‘Working Out Loud’ is a mindset, and approach to working where we share our thinking as we go and learn to succeed within a community. That sense of iteration and co-creation are central to this work. Under the Dynamic Change Framework, the future state is not imposed upon people, but rather co-created with them. It’s a framework that allows people to invest in the future state and, through that investment, be part of the change community. Under this mindset, the role of the organisation is less about defining and controlling change, more about framing it and then getting out of the way to let it happen. I have tried to strike a balance in this book between theory, understanding how systems change, understanding the emergent power of community in the Social Age, understanding the resistors and amplifiers of change, and practice, the practical steps that we can take to transform our organisations. Broadly speaking, the first part of this book explores theory, exploring the change curve itself and those factors which resist or amplify change, and the second part of this book, where we introduce the Dynamic Change Framework, is based around eight practical steps in the change journey. Getting this balance right is sometimes hard, especially as one of the central premises of this book is that everything has changed. I usually say that I will be happy if people read something and find it interesting or enlightening, but that I hope the legacy will be a reputation for getting things done. This book is certainly intended to be about getting things done. Change is a long process, but I hope this will act as a handbook and companion along the way. This entry was posted in Change and tagged Books, Change, Change Curve, HR, Leadership, Socially Dynamic Organisation, WorkingOutLoud, Writing. Bookmark the permalink.